Our new Trellis Lace Handkerchief offers a delicate lace pattern that resembles leaves on a garden trellis. 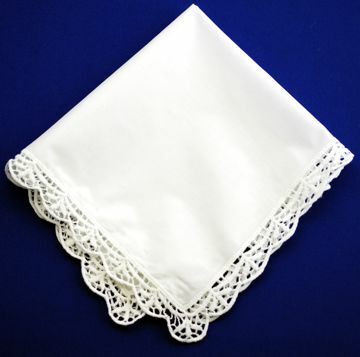 It is 100% cotton and measures approximately 12″ square with 5/8″ lace border. Makes a great gift as is, or it is ready for the addition of your embroidery to make it a special, personalized gift. Sorry out of stock ! Til further notice!